I am addicted to old home economics textbooks. I love the calm, matter-of-fact voice in which the authors tell you that "Very glossy satins, and harsh tweeds are unbecoming to the mature figure and to the person whose complexion has lost the vitality of youth" or ask you to fill out a quiz to determine if you are an "all-around girl: sincere, wholesome, charming" or a "coquette: flattering, petite, scatterbrained." Study the current fashion magazines, newspaper sketches, and make several tours of the better shops and shop windows to see what is being shown. Take an inventory of your wardrobe on hand to find out your most essential purchase. Decide upon color, general lines, kind of material and size. Do not accept a substitute. If you choose a printed material, moisten your finger and rub it over the hem to see if the color is permanent. Many prints fade and become ugly under the arm and across the shoulder. 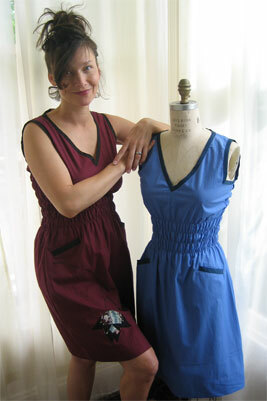 If you choose a wash dress look for a color-fast and shrinkage label. See that all pieces are cut the right way of goods to avoid constant twisting. Move your arms and make sure the back is full enough. Sit down and make sure the skirt is full enough. 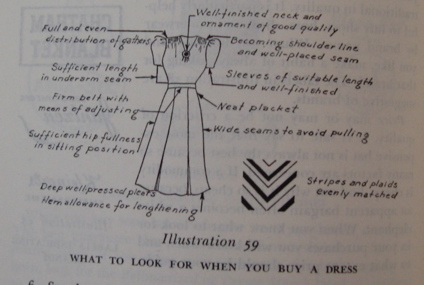 For additional points in buying a dress study illustration 59.
from Clothes with Character, p. 222. What I like best about this list is the professionalism of it. "Study" the fashion illustrations! Follow this checklist! Being a well-dressed woman is work, not play, and don't you forget it! I love this dress from Shrimpton Couture. 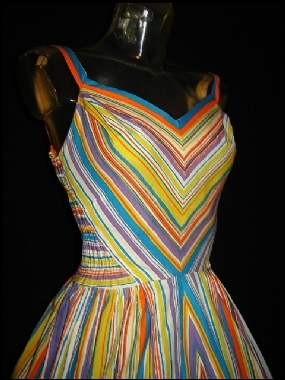 The matching of the stripes is just perfect, and the way they narrow to a point at the center front is sure to emphasize a slender waist (or create one). It's 36B and $145 … I have to say that I think that's worth it, just because every time I have to match stripes this way, I end up a bedraggled mess, hair on end, the air around me blue with cursing (and I have convenient access to large dictionaries of slang, so it's not just your run-of-the-mill swear words being bandied about, I have to tell you), seam ripper tightly clenched in my fist … I'm surprised anyone who touches a dress that I've had to match stripes on doesn't get an electric shock. There are more pictures at the site; go click the image to visit them. By the way, please don't click on this, unless you have something to scrub your eyeballs with after — just the words "party halter gaucho jumpsuit" should be enough to give you nightmares for quite some time. (They did me.) See what I go through to bring you cute cheap dresses? That's what they say on the front; there's also a back template that says "Confused by this card? Visit http://www.dressaday.com&quot;. I'll put up a little explanation about it in the next couple days. You can download the front here, and the back here. They're both PDF files. I spent a little time last night looking for citations about the average size of the American woman, retail information, etc. This article was the most easily accessible online and had the clearest citations for some of the most-repeated pieces of information, such as "Since 1985, the average American woman has grown from a size 8 to a size 14!” It's not a feminist-theory publication, either — it's a marketing trends report from USC. I also found some fairly off-putting stuff, like two Rocky Mountain News columnists (talking about a law in Argentina requiring stores to stock a full range of sizes) saying "Those empanada-chomping suburban women will get no sympathy from size-zero supermodels." I know it can be just as hard for people on the 0-2 end of the spectrum to find clothes, plus there's not as much sympathy. ("You're so skinny, you can wear anything!" Well, no — not if the chest gapes, the sleeves billow, and the waistband falls off your hips!) And god forbid you are bigger than a C-cup and a small size. You might as well write away for the Frederick's of Hollywood catalog and be done with it. So write your size (whether it's larger or smaller than what's in the store) on the back of the card if you use them. If you would have bought a particular thing, write something like "blue sundress, $100" too. Make it as real as possible. Turn that vague size-14 statistic into real money, and show them that money walking out of the store. The stores won't know that they're not serving your needs unless you tell them. What do I like best about this dress? I can't decide whether it's that it's made of men's shirting (wonderful fabric, very smooth and light), or whether it's the bias contrast trim, or whether it's the pockets. This dress is $95 at modaspia (click on the image to go to their site). The only downside is that it's not available any larger than a size 10. I asked one of the designers about that, and she told me that they used to make bigger sizes, but wholesalers and boutiques wouldn't buy them! Grrr. 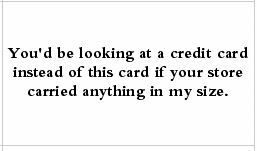 So I was thinking about making a little downloadable business card, a pdf that you could print out on those Avery tear-apart business card forms, which would read something like "You'd be looking at a credit card instead of this card if your store carried anything in my size." Then you could hand it to the sales staff or just leave it on the counter. What do you think? What should the wording be? Leave your input in the comments, please! Isn't it adorable? I love the red and the red-orange print together. My only quibble is that she didn't solve the no-pockets problem (so that I could be lazy and just copy whatever she did). I guess that's why she's a Villain Extraordinaire … her evil plan is to make me actually think. Dammit. 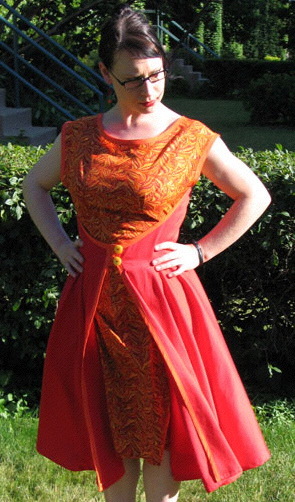 I'm now even MORE hepped up about doing this dress, pockets or no pockets. I have some yellow polka dot fabric that keeps falling off the shelf RIGHT ONTO THIS PATTERN, which is on top of the cutting table. I think it's trying to tell me something. All right, all y'all who had such nice things to say about my Twister skirt, now's your chance to buy something similar! Or to mutter excuses like "I've already spent my eBay budget this month" or "polka-dot isn't really my color" or "it's not my size, so sad!" Note — I didn't make this one, it's vintage. 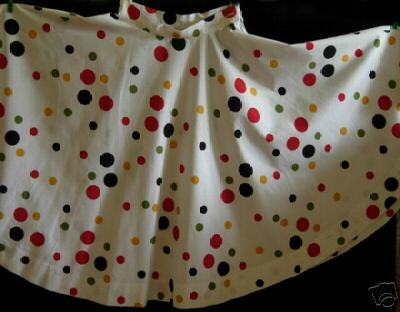 I'm not the seller, although I admit to feeling a strong sense of kinship with anyone who likes multicolored polka dots! Bidding starts at $19.99 and the auction ends Tuesday the 27th of June. Waist is 26". Click on the image to visit the auction, and if you win it, thank Lisa, who sent me the link. And then let's figure out when we'll both be in NYC so we can go roller-skating together in our polka-dot glory.